Heat olive oil in a large stockpot over medium-high heat. Add the carrots, celery, onion, garlic, thyme, and bay leaf and cook, stirring frequently, until the veggies are getting tender and everything smells really good - about 6 minutes or so. Add the chicken stock and bring to a boil. Reduce heat to a simmer and add the chicken. Simmer for about 20 minutes or as long as you can wait. Sometimes, we let it simmer and go for a walk for an hour. Whatever you can do. While it's simmering, prepare your zoodles using this recipe. Add the rinsed zoodles to individual bowls, and ladle a couple-few ladle-fulls of chicken soup over the zoodles. Notes: You can just as easily sub egg noodles for the zoodles. Just add them to the soup after it's simmered for 20 minutes, and let them cook through before adding the chicken. 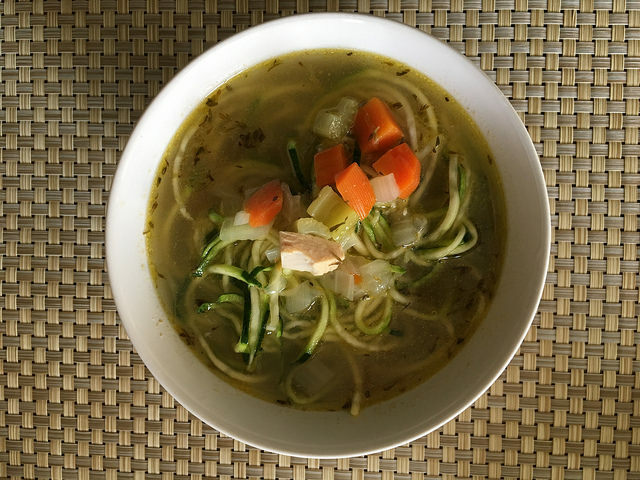 This is the best chicken soup recipe ever. Perfect for cold days, or hot days, or whenever you need soup. You can keep it going for a few meals by adding more stock, more veggies, more chicken. We usually get two meals plus a lunch out of a pot.